This is another novella longlisted for the Independent Foreign Fiction Prize, and it’s a masterly example of the form. The theme is the disintegration of a marriage, but the plot and structure make it quite different to anything I’ve read before. 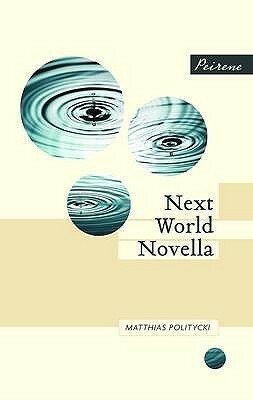 Next World Novella by Matthias Politycki is a clever title: it plays on Doro the wife’s preoccupation with the afterworld and Hinrich the husband’s alternate world, the one he plays around in when he’s not at home. There is also a fictional world of male fantasy, because although Hinrich is a mediocre Sinologist who writes academic stuff, he’s also ventured into the world of fiction. All this is revealed in a macabre narrative that alternates between scraps of Hinrich’s novel and a detached narrator’s rather wry observations of Hinrich’s grisly attempts to deal with Doro’s body while he reads the papers she’d been working on. These papers reveal that this marriage was not what it seemed. Like many an oblivious partner, Hinrich in his self-absorption has failed to notice all kinds of aspects of his wife, and his reaction is rather amusing. The irony is that since he had an operation to improve his always very poor eyesight, he has been blind to his own behaviour. Even when the betrayer is betrayed, it doesn’t seem as if Politycki is much interested in engaging the reader’s sympathy for his character! I haven’t read much in the way of contemporary German fiction, and all of what I had read was serious in tone, so it was interesting to discover a German author with a playful sense of humour, albeit black humour! For reviews from the rest of the Shadow Independent Foreign Fiction Prize Team, click here. LOL Stu, what is it with you blokes and ‘the ale’?! I visited your blog to re-read your review and discovered a thriving conversation in Comments about this author and his taste for ale!! I agree with Stu that I found this book very moving. But it also has a very wry sense of humour. It seems you enjoyed this, of which I am glad. I think it is one of my favourite Peirene’s. Glad you enjoyed this one, Lisa. I met the author last year at a reading in London and he was delightful to chat to; quite self-deprecating. Watched Stephen Fry on Literature last night, talking about translating Shakespeare into Chinese. Now *that* would be a major headache! This one sounds like one for me, up my alley. I like humorous novels. I do too, as long as it’s not overdone.